Hey, we sort of hit a wall writing about living with food allergies, just like we hit a wall before that writing about personal care products we make, and home cleaning products we make. It turns out, sometimes there are only so many things to say about any given topic. At least for now. We haven’t officially retired any of our series; we’re just letting them hang out until we’ve got more to say. We’re also going to go back through and make sure the posts are all properly categorized in case you ever want to find them again. As always, we’re a work in progress. Isn’t that life, with or without allergies of any sort? So for a lighter topic, I’m happy to introduce to you today our Kitchen Stories. The first post kind of explains it all. I was looking at my tea kettle over the weekend as I was making tea and realized it was just one of many of my kitchen tools that have a story. My first kitchen was a harvest gold masterpiece (there were flecks of metallic gold in the counter top (formica)! It was, as my roommate and I would have described it at the time, “Klassy with a capital ‘K’.”) It was this so-awful-it-makes-a-great-story 1970s cinderblock masterpiece, with no insulation and radiant ceiling heat. We could grow mold on the walls, and every fixture in the bathroom and kitchen was apparently leaking into the ceiling of the apartment beneath us. But my roommate and I were thrilled beyond measure to be in an “adult” apartment where we had to figure out how to feed ourselves on a daily basis. We had a full block of knives (my birthday gift from my parents that summer) and a decent number of kitchen utensils we’d bought or scavenged from our parents’ kitchens before moving out. But we were woefully low on actually useful cooking things. There was a Goodwill a few miles from our apartment that was a source for most of the rest of what we needed, and my first good score was the Revereware kettle that I still use today. I’d had a fancier kettle in college, a red one that I think my mom bought because it was a nifty color, but it was dropped once and the paint started flaking off, inside and out. I want to say that I splurged on this kettle — I think I paid $5, and I did buy some SOS pads at the grocery store to shine it up. That was in 1999. Last century. That kettle has made thousands of cups of tea — nothing else gets you through a damp Oregon winter, or a well-below-zero North Dakota winter, or just a plain fun northeastern New Hampshire winter. It served me through the Cup-O-Noodles phase that happened between grad school and finding a real job. Mostly, it’s made tea. And some coffee. But tea. A literal ocean of tea. I was raised Irish, and therefore firmly believe that tea will likely solve any problem. Or, if not solve it, soothe it or give you a break from it. Tea is magical. As such, the ever-important kettle is rarely ever put away. 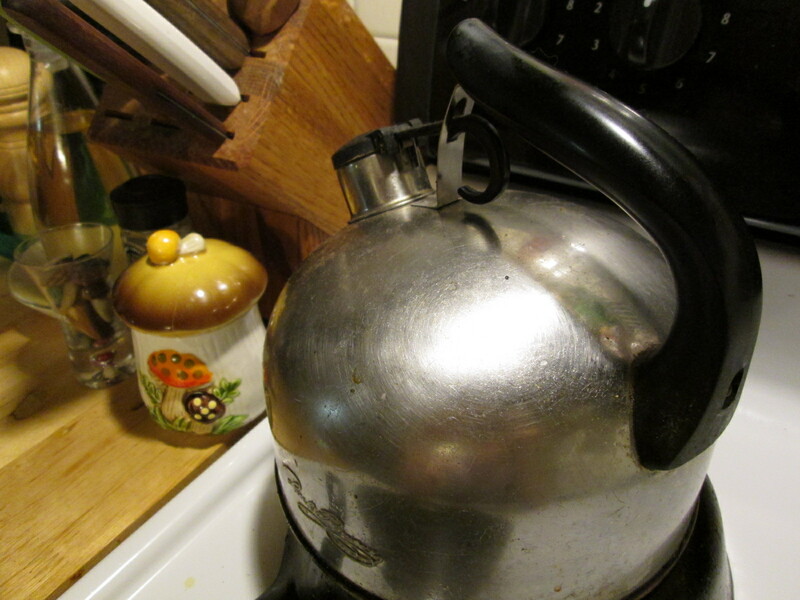 It is always on the stovetop, ready to serve (and likely full of the leftover water from the last round of tea). This kettle is the workhorse of my kitchen, and sometimes, using it reminds me of the first kitchen that was “mine.” It’s been with me for the 6 subsequent kitchens, as well. What are the workhorse pieces in your kitchen? Do they have history? My mother had the same one but she also had Revere cookware. She would spend hours keeping the bottoms all shiny. I tried it once and decided stainless steel was a much better choice for me. Sharp knives, kitchen shears, All-Clad cookware and my Vitamix are at the top for me. Mary, the bottom of my kettle is almost black. I do have a copper-bottom saucepan, too, that’s a little shinier. It doesn’t live on the stove, though. We’re all jealous of your Vitamix!